Hoss frontman Pete Lindenmeyer and other musicians perform Sept. 1 at Two Brothers Roundhouse in Aurora as part of a benefit concert for fellow musician Michael Heaton, who is battling cancer. 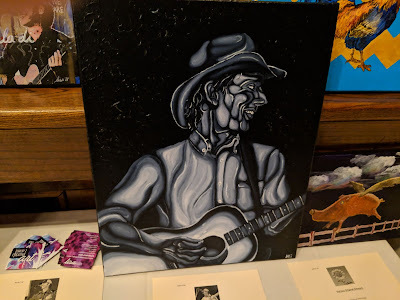 Musician Noah Gabriel Giblin painted this portrait of Michael Heaton, which was auctioned off in a silent auction as part of the benefit concert. In a show that put the true meaning of friendship on display, area musicians performed on Sept. 1 at Two Brothers Roundhouse in Aurora in a benefit concert for fellow musician Michael Heaton, who is battling cancer. Kevin Trudo performs the Michael Heaton song "We're Not Sleeping." Singer Pete Jive and other musicians, including noted guitarist Pat Bergeson, perform Michael Heaton's song "The Good Times." Musician Michael Heaton thanks his fellow musicians and those who came to a benefit concert for him. Musician Ralph Covert performs the Michael Heaton song "Souvenirs." Joined by noted musician Pat Bergeson on harmonica, musician Dave Ramont performs the Michael Heaton song "Rhum and Coffee (For Guy Clark)." Joined by the horn section from the band Pawnshop, Hoss frontman Pete Lindenmeyer performs Michael Heaton's song "Smells Like Gasoline." 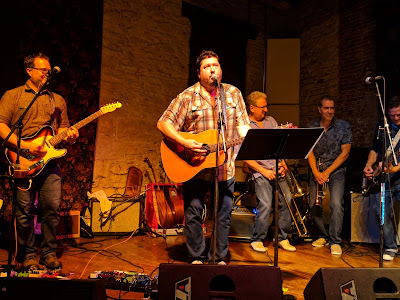 Musicians perform Sept. 1, 2018, at Two Brothers Roundhouse in Aurora as part of a benefit concert for fellow musician Michael Heaton, who is battling cancer. Kevin Trudo leads the band in a version of The Who's "Won't Get Fooled Again," which Heaton has played at his show on a regular basis.